The Log Cabin in Kirkmichael, near Pitlochry, Perthshire sleeps 5 people. 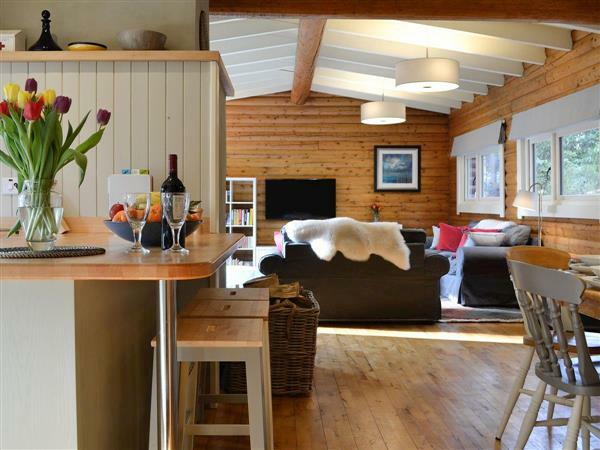 The Log Cabin near Pitlochry is detached log cabin, with a turf roof, which has been carefully furnished throughout to provide stylish and welcoming accommodation. Its mix of contemporary furnishings combined with the wooden walls creates a warm and inviting home, perfect at any time of the year. The high ceiling in the living room provides a light and airy feel, whilst the cosiness of the wood burner is a real delight on colder days. The living room leads out onto the patio overlooking the garden. Its idyllic location, amongst a variety of trees in a secluded position, yet within easy access to the village of Kirkmichael, makes it a real haven for relaxation. Watch the variety of wildlife on the doorstep - plenty of red squirrels, roe deer and woodland birds who love the peaceful environment, can be easily seen. From the sloping 3-acre garden, interspersed with pathways, there are excellent walks through the mixed woodland onto heath and moor which opens up to breathtaking views, perfect for hill and dog walkers. In particular there is the Cateran Trail – a 100 mile circular walk through the Angus Glens and Perthshire. Winter sports at Glenshee Ski Slopes provide extensive skiing and snowboarding facilities, and are located just a short drive away. The popular towns of Pitlochry and Blairgowrie are just 13 miles equidistant with a great variety of shops, a theatre, fine dining restaurants, cafés and a distillery, all well worth a visit. Golfers can test their skills on over 30 courses in the area, and for the more adventurous there is mountain biking, fishing and horse riding. Throughout the year many events are held in the region including The Strathardle Gathering every August (Highland Games), The Etape Caledonia Cycling Event in May, The Perthshire Open Studios and The Blairgowrie Book Festival in October, which can be enjoyed whilst staying in this lovely property. The shop, pub and restaurant are 1 mile from The Log Cabin near Pitlochry. Living area: With wood burner, 49 Freeview Smart TV with Netflix, double sofa bed (for flexible sleeping arrangements) and wooden floor. Kitchen area: With electric oven, induction hob, microwave, 2 fridges, freezer, dishwasher and washing machine. Economy 7 heating (underfloor in bathroom), electricity, bed linen, towels and Wi-Fi included. Initial logs for wood burner included. Travel cot and highchair available on request. Welcome pack. Large garden with sitting-out area and garden furniture. 3-acre grounds with woodland. Hot tub for 5 (private). Private parking for 2 cars. No smoking. Please note: This property has a natural water supply from a spring. Holidays at The Log Cabin run from Friday to Friday. Pets allowed at The Log Cabin. For a better idea of where The Log Cabin is, you can see The Log Cabin on the map below. The Log Cabin is in Perthshire; should you be on the lookout for a special offer, you can find all the special offers in Perthshire. It's always worth checking to see what is on offer at the moment. Do you want to holiday near The Log Cabin (UK5671), you can see other cottages within 25 miles of The Log Cabin; have a look to find your perfect holiday location.